PICTURED: Drs Chandrakant Shah and Sudha Shah extended his nearly 50 years of commitment to Indigenous health with a gift of $100,000. For Dr. Chandrakant P. Shah, professor emeritus at the Dalla Lana School of Public Health and Honorary Consulting Physician at Anishnawbe Health Toronto (AHT), commitment to Indigenous health goes back more than four decades. In the mid-70s, the University of Toronto professor of Public Health and paediatrician first volunteered to serve as a clinician for 26 First Nations in the Sioux Lookout Zone, a role he continued until 1988. “As a relatively new immigrant to Canada, I had no exposure to First Nations people. When I visited one of these communities, I was taken for a home visit by canoe to see a woman struggling with multiple sclerosis as she could not travel to the clinic. When I visited her, she told me her major concern was not her own health; she was worried for her four young children who did not have enough to eat. Her home was cold and drafty; it had no indoor plumbing and the kitchen cupboards were bare. I was heartbroken. I thought to myself, here in Canada, we boast about being the breadbasket for whole world, and yet, in my own backyard, children are starving,” remembers Dr. Shah. “While I continued to visit First Nations communities to provide healthcare services, I also began to understand that First Nations, Métis and Inuit peoples living in urban areas were a growing population. Today, 60 per cent of Indigenous people live in Canada’s urban cities,” says Dr. Shah. After his retirement from the University of Toronto, Dr. Shah agreed to come to work to support Toronto’s Indigenous community as a physician at AHT. Dr. Shah worked alongside and collaboratively with traditional healers, medicine people, counsellors and other multidisciplinary health-care professionals to help urban Indigenous peoples reclaim their health and cultural identity. More importantly, he has been a strong advocate for self-determination and the leadership by Indigenous people, including the role of traditional healing practices in moving healthcare forward. He also successfully advocated for the inclusion of more information about Canada’s First Peoples in Citizenship information for new Canadians so that people like him and his wife Sudha, who came to Canada in the early 60s, would have a better understanding of the impact and history of Indigenous people on our country. Today, at the age of 82 and after he has now retired (for a second time) from his day-to-day work as a staff physician at AHT, Dr. Shah continues to support the work of Anishnawbe Health as an honorary physician consultant. He provides advice and guidance on current issues. He volunteers as a board member and chair of the finance committee for its new foundation where he is actively recruiting donors, sponsors and partners to support the campaign for a new home for the organization. Always one to lead by example, the Shahs and their family have made their own leadership gift to the campaign. 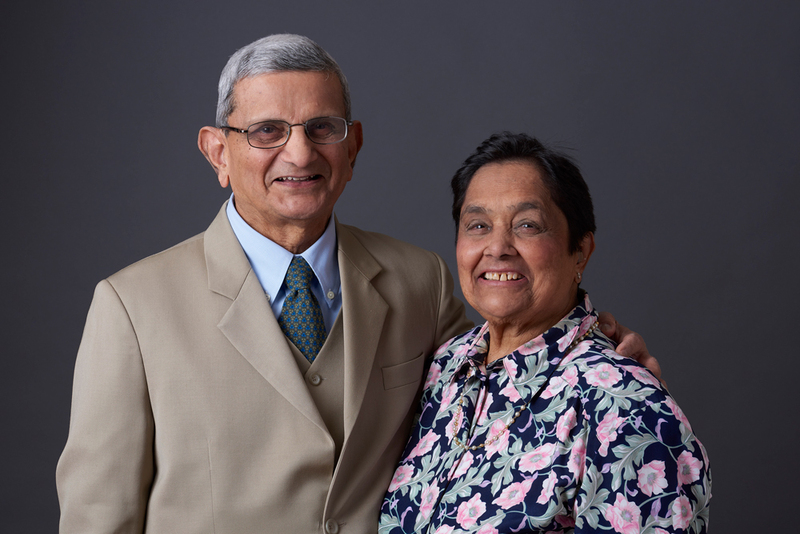 Dr. Shah and his wife Sudha donated $100,000 to support the foundation’s campaign to raise funds to support a new home for Anishnawbe Health that will bring all of its services and programs under one roof. In recognition of this gift, the reception area on the primary care floor of the new health centre will be named in honour of the Shah family. “I strongly believe in the need for a new facility for Anishnawbe Health. Primary health care was the focus of nearly 20 years of my career and I knew it was where we wanted to direct our support,” says Dr. Shah. This reception area is the first point of contact for clients visiting primary care physicians and team members for medical challenges and to seek support in managing chronic disease such as diabetes and hypertension. For more information on how you can join the Shahs in supporting the work of the Anishnawbe Health Foundation, visit http://support anishnawbe.ca/the-campaign/a-new-home-for-anishnawbe-health. Grant’s Desi Achiever Dr. Chandrakant Shah is a Canadian physician, researcher and social activist. Dr. Shah has been a staff physician since 1996, providing primary health care to Toronto’s indigenous community as well as people who have been marginalized, such as the homeless, the unemployed and children living in poverty. He was bestowed the Order of Ontario in 2005 and the Queen Elizabeth II Diamond Jubilee Medal in 2012. Bringing Awareness of Aboriginal Issues in the Citizenship Examination for New Canadians published by Dimension, Canada Race Relation Foundation (CRRF), details the efforts of Dr. Shah to update the Canadian citizenship examination with a more robust understanding of First Nations and Aboriginal Canadians. The condensed version below was published in 150 Stories: Celebrating Canada’s Sesquicentennial, which pays tribute to Canada’s diversity, democratic principles and multiculturalism by telling the stories of remarkable Canadian individuals, organizations, initiatives and historic events. I immigrated to Canada in 1965 after medical training in India, the United Kingdom and the United States. At the time, Canada was a less receptive country for visible minorities, and I faced a significant amount of discrimination in my professional life. In Ontario in particular, I was told that I would never get a license to practise medicine no matter what my qualifications were. This attitude led me to British Columbia to practise medicine. I returned to Ontario in 1972 when I was approached by the University of Toronto with an offer of a professorship in the Department of Preventive Medicine and Biostatistics and a staff physician at the Hospital for Sick Children. In 2007, I was recognized as an Outstanding Physician of Ontario by the same organization that had rejected me in 1965. This experience shaped my work and my advocacy efforts over the years. At the University of Toronto, I worked to shift thinking on diversity in faculty composition. UofT is the largest Canadian university, in the most diverse Canadian city where visible minorities constitute over 50 per cent of the population. By 1999, the university’s student body reflected the diversity of Toronto, but the same was not true for its faculty (only 8.7 per cent visible minorities). During this period the university had made several pledges to increase the diversity of its faculty but very little had been achieved. In January of 2000, The Toronto Star published my interview with them about the lack of a plan to increase faculty diversity by administration at the University of Toronto. Working with a colleague, I had constructed a model to show projected diversity rates within faculty, based upon current efforts, would take 52 years to reach 15 per cent! The Toronto Star report drew a large amount of attention and resulted in changes in hiring policies and proactive recruitment. By 2014 (a mere ten years later), U of T achieved 15 per cent of visible minorities in the faculty. I have also focused my efforts to help Aboriginal peoples. I was always bothered by the citizenship examination and the lack of Aboriginal history content. The citizenship department requires all immigrants who wish to become Canadian citizens be well versed in certain aspects of Canada such as its parliamentary system, organization of provinces and local governments, as well as aspects of historical perspectives, such as the role of ‘founding nations’; and it had three cursory lines about the Aboriginal population. There was no mention about the treaties that were signed; about the forced process of assimilation through residential schools; the “sixties scoop”; and how systematically, Aboriginal peoples were stripped of their culture, heritage, language and belief system. In 1991, I began a one-person letter writing campaign to the governments of the day, churches, and social organizations about the need for a change in the Citizenship Guide to provide more information about Aboriginal peoples to new immigrants. Since Confederation, new immigrants represent at least sixteen per cent of the Canadian population, yet they have very little or almost no knowledge about Aboriginal peoples – leading many new Canadians to hold stereotypical negative views towards Aboriginal peoples. My letter-writing campaign lasted for almost three years and as a result in 1994 the materials provided in citizenship guide and the citizenship exams were updated. The guide now includes relevant material about Aboriginal peoples and questions on the exam. Since 1994, over two million new Canadians are now aware of Aboriginal peoples and their history; as will all the future newcomers to Canada be. This has been in keeping with the spirit of Truth and Reconciliation Commission Report.